Just like the insulation installed in the walls and floor of your home or building, attic insulation can keep you warm in winter, cool in summer, and save you money all year round. But when attic insulation is not properly monitored and maintained, things can, and do, go wrong. A lot can happen to the attic insulation from when it was first installed. New technologies often make older insulation, and the techniques used to install it, obsolete, leading to higher energy bills, compared with more modern solutions. Insulation materials can break down over time, reducing efficiency and raising costs. When roofing is repaired or replaced, the insulation underneath it is often ignored. Rodents, raccoons, birds and insects leave feathers, eggs, carcasses, fur, skin, excrement, and other unwanted matter, embedded in the insulation material. This, combined with water from a leaky roof, creates a fertile breeding ground for toxic microbes and mold. Residue from animals living in your old insulation is a potent cocktail of dangerous microbes. Breathing in the fine particles or touching this matter can cause serious illness or even death. Live animals are often lurking in attics and can be carriers of disease, such as rabies. Whether you know it or not, the insulation in your attic could contain asbestos, a known carcinogen, and must be professionally removed. Old fiberglass often breaks down into fine particles that could be absorbed by your bare skin or inhaled. This can cause extreme discomfort or grave illness. Ceiling joists, hidden by blown-in insulation, may send you stepping through the attic floor, sustaining damage to your ceiling or injury to yourself. Removing old attic insulation requires special equipment and supplies to do the job safely and correctly. Protective clothing is worn to guard against exposure to dust and debris. Areas leading to the attic are isolated with plastic curtains to prevent the spread of particles. Material removal must be pre-planned and coordinated. Blown-in insulation must be removed pretty much the way it was installed – with air. Using a custom-designed high-powered vacuum, insulation, dust and debris are collected through a long hose leading to special filter bags. 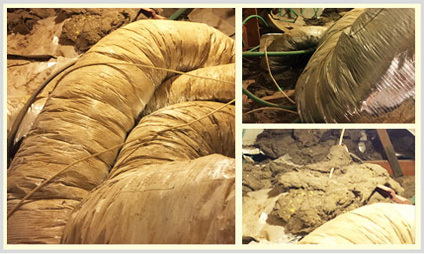 Batt insulation is placed in contractor trash bags and manually removed from the attic. Again, this needs to be done professionally to avoid particle contamination, leading to health risks. Removing and replacing old attic insulation is probably not something you can do yourself. So finding the right professionals for the job can make all the difference. Whether your attic requires an inspection, removal or replacement of your current attic insulation, Quartz Solutions is the one name you need to know. For friendly professional advice over the phone, call 201-205-2042, 973-536-1013 or request a complimentary inspection.